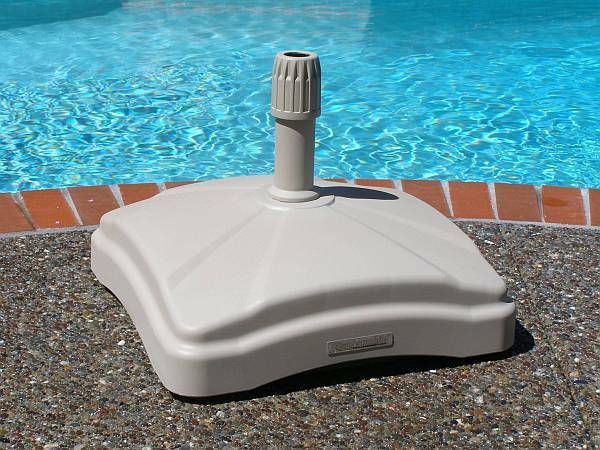 The durable Shademobile® Outdoor Rolling Umbrella Base makes moving your heavy patio umbrella a breeze. Most umbrella bases are stuck under a table and are very heavy, making it a challenge to move the umbrella to where it is needed most. The Shademobile® rolling umbrella stand allows you to relocate your umbrella as the sun moves. The Shademobile® is the most versatile and easily movable umbrella base on the market. Weighing up to 110 lbs when filled with sand, the Shademobile® rolls easily on 4 soft rubber wheels and locks into place with a patented locking system. Made of high-density polyethylene plastic, this base is long-lasting and will not chip or crack over time. 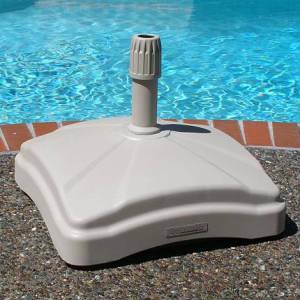 The center post fits umbrella poles of 1.4 inches to 2.06 inches in diameter. Learn more by watching the Rolling Base Video.